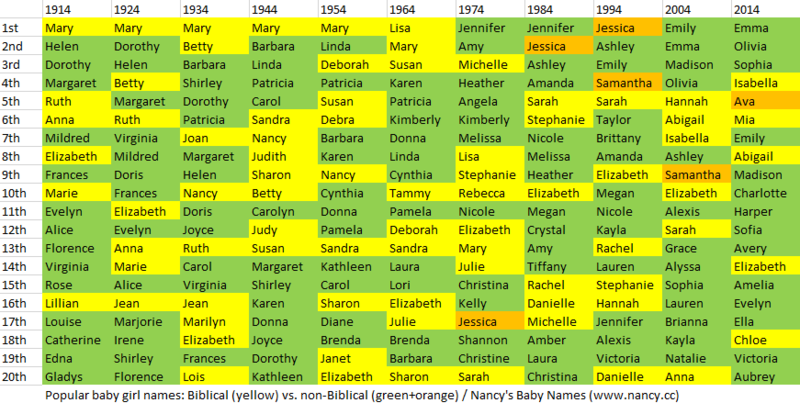 How popular is the baby name Madelyn in the United States right now? How popular was it historically? Find out using the graph below! Plus, check out all the blog posts that mention the name Madelyn. While we wait for news about the next U.S. president, let’s talk about Stanley, the late mother of the current U.S. president. Stanley Ann Dunham was born in 1942 to Stanley and Madelyn Dunham of Wichita, Kansas. According to most sources, her father had been hoping for a baby boy. When a baby girl arrived instead, he stubbornly decided to pass his name down regardless. Since her teenage years as a moviegoer at the commodious Augusta Theatre, Madelyn had devoutly followed the film career of Bette Davis, her favorite actress. A new picture starring Davis and Olivia de Havilland reached Kansas during the summer of 1942, while Madelyn was pregnant. In the movie, In This Our Life, Davis and de Havilland played the two Timberlake sisters, each with a man’s name: Davis was Stanley and de Havilland was Roy. According to Maraniss, this is what inspired Madelyn to name the baby Stanley, and the fact that the baby’s father was also named Stanley was just a coincidence. The movie In This Our Life was based on a Pulitzer-winning novel of the same name by author Ellen Glasgow. The 1941 novel is set in Glasgow’s home state of Virginia — one of the many states throughout the South in which family surnames were often bestowed upon baby girls (especially in families without many sons). Stanley Ann Dunham “was teased mercilessly for her name” as a youngster, according to Barack Obama in his book Dreams from My Father. She ended up dropping “Stanley” and simply going by “Ann” as an adult. Interestingly, Sir Henry Morton Stanley was born John Rowlands; he created the name “Henry Morton Stanley” for himself upon emigrating to America from England. What do you think of the name Stanley for a baby girl? Maraniss, David. Barack Obama: The Story. New York: Simon and Schuster, 2012. Obama, Barack. Dreams from My Father: A Story of Race and Inheritance. New York: Crown Publishers, 1995. According to the Cincinnati Vital Records Office, the most popular baby names in the Ohio city last year were Ava and Jackson. I’m surprised that the #6 name for girls is Aubree and not Aubrey. In nearly every U.S. state* in 2014, the preferred spelling was “Aubrey.” Ohio itself welcomed 360 Aubreys to 226 Aubrees that year. For more sets of rankings, see the name rankings category. For U.S.-specific rankings, see the U.S. name rankings subcategory. *The one state that preferred “Aubree” was Montana.